Only Alex Song knew what he was thinking about and as he lay on his back, staring up at the heavens from inside his penalty area, the West Ham midfielder had a moment to ask himself the question. Harry Kane had not looked to be in an overly threatening position because Aaron Cresswell, the West Ham full-back, was covering, but Song momentarily lost his composure. He put his hands on Kane, the contact was clear, the Tottenham striker went down and the referee, Jon Moss, was compelled to give the penalty. For Tottenham it was the prompt for yet another important late goal while for West Ham it would represent the frittering away of yet another lead. Kane did not score from the spot, Adrián reading his intentions and saving the kick but when the rebound fell kindly to him, he knocked in his 24th goal of a sensational season. It was the last kick of a pulsating derby and if Tottenham could feel relief, having trailed by two goals with nine minutes to play, there was only nausea for West Ham. They had arrived in sticky form after an FA Cup hiding at West Bromwich Albion. Moreover, the future of the manager, Sam Allardyce, continued to represent an unwelcome distraction. Out of contract in the summer, the club�s owners have no plans, at present, to even discuss a renewal, despite him having exceeded expectations this season. But for so long, it appeared that Allardyce and the travelling support were primed to celebrate another victory at this stadium � to go with the two from last season, in the Premier League and Capital One Cup. They had taken charge upon Cheikhou Kouyaté�s first-half header and when Diafra Sakho got the second on 62 minutes, the die seemed to be cast. Tottenham had Hugo Lloris to thank for keeping the scoreline at 2-0. Yet Danny Rose�s streaky goal sparked the Spurs fightback and although this was not the result that they wanted in the race for a top-four finish � and to capitalise on Manchester United�s loss at Swansea City on Saturday � they were more than happy to take it. Tottenham have won 13 points this season thanks to goals in the final five minutes of matches and it is becoming a recurring theme to hear Mauricio Pochettino, the manager, salute the never-say-die attitude of his players. This was a contest that was dotted with spicy challenges and errors on the ball, with the majority of the latter coming from Tottenham in the first half. Mousa Dembélé was the biggest culprit and when he lost possession in his own defensive third, West Ham exacted full punishment. They worked the ball smartly to Cresswell and his cross was headed in by Kouyaté. Dembélé endured something of a nightmare and it was no surprise when he did not reappear for the second half. He was replaced by Christian Eriksen, who had been the surprise omission from Pochettino�s starting XI. Tottenham had begun as the brighter of the teams and they went close to taking the lead. Nabil Bentaleb worked Adrián from distance while Kane charged on to Rose�s long ball and guided a shot against the outside of a post. Kouyaté�s goal settled West Ham while it unnerved Tottenham. Dembélé was not the only player in a white shirt whose passing sights were awry and the crowd could not help but show their frustration. Although Rose went close with a 26th-minute header, it was West Ham who came to look more dangerous. 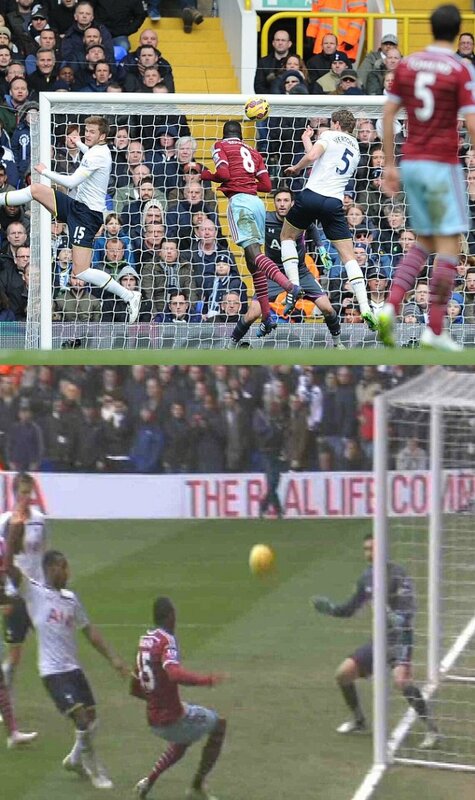 Lloris blocked from Sakho and Enner Valencia in the first half, and he thwarted Sakho again on 58 minutes, after Mark Noble had put him clean through. Sakho, though, would not be denied and, following Noble�s cross and with the Tottenham defence again in disarray, he volleyed home from a tight angle at the far post. Valencia was in an offside position in the middle and Pochettino argued that he had interfered with play. West Ham had a let-off when Noble � already booked for a shirt tug on Andros Townsend � lunged in to catch Bentaleb on an ankle. The referee spared him a second yellow card but Tottenham had a bigger let-off when Winston Reid headed square for Valencia and from point-blank range, he was denied by Lloris. There had been no hint of the grandstand finish but Tottenham started it when Rose�s shot, after a corner had been half-cleared, bounced down into the ground and looped up and over Adrián into the corner. But, just as it looked as though time would defeat Tottenham, Song suffered his rush of blood.